A holiday home is many, if not all, people's dream. However, this can be a costly enterprise, or you may feel guilty living so abundantly as to have to large buildings for one family! Well today we will look at a quiet little house, the emphasis being on little! 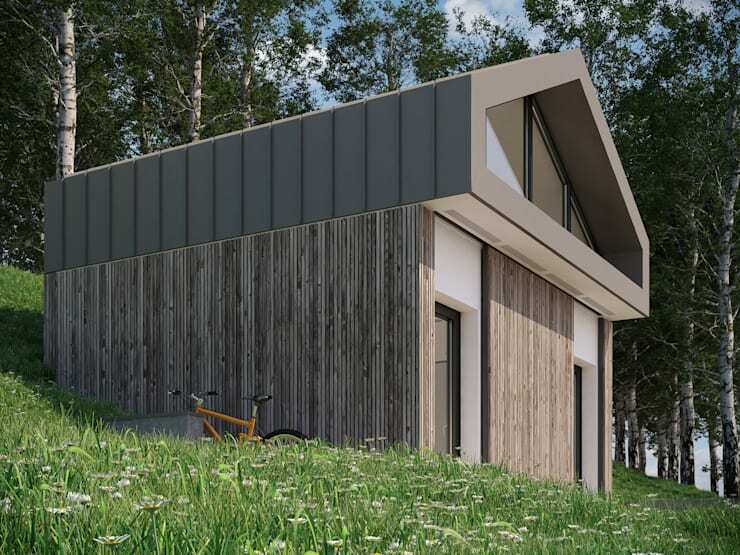 The Microhouse is a refuge and retreat from the excitement of the city, consisting of a mere 35 square meters of total area, and designed to fit spontaneously into the natural landscape. This project is a shining example of living fully with simplicity, and of the power of minimalism. You can have a wonderful holiday home without wasting resources or too much money. As we will see when we take a tour of this charming little house, it had been designed thoughtfully and with great attention to detail, which allowed for all of the features to fit into such a small space. Intrigued? Well, let's not waste any more time and get right to it! 3D-Arch is the firm behind this exciting project, and the home was driven by the same philosophy that guides the company: The belief that mini housing units are more environmentally-friendly, since they produce less waste not only in their operation once realised, but also in the building process of the home. Simplicity is at the heart of the building, although it has many interesting details that give it character. The structure recalls the handiwork of a child with building blocks—a simple cube with a triangle on top. This minimalist design is very popular with contemporary trends, in addition to achieving the objectives of the architects. The minimal structure that blends in visually with the environment had also been intended to bring the house back to the original 'refuge' for a family. This project focused on three points: the quality of space, eco-sustainability and cost of implementation. By creating such a minimal, yet functional building, the architects easily achieved high marks in all three categories. The impact of the second consideration, eco-sustainability, is significant. Drawing from the environment, the house was designed to manifest a strong character through fluid lines and a natural rhythm mimicking the surrounding landscape. Not only will you have spectacular views of the countryside living here, but you will also feel a part of it! Exposed concrete had been used as construction material for the enclosure of the house, whilst the bottom is covered with slats of larch panels, which had also been used on the facade. This species of wood has a lovely hue and is suited to the environment. The roof had been constructed from zinc, in order to accommodate several photovoltaic solar panels. This will allow for the generation of energy necessary for the home's operation. The study of space the architects employed for this project focused on the design of minimal environments, and we can see how it has come to fruition here in the living area of the home. The idea was to create space which are equally functional and comfortable, without having to sacrifice on for the other. In essence, they wanted to create rooms in which you can live happily every day. In the 25 square meter of the ground floor of the home, the architects have managed to include a living room, dining room, kitchenette, and a bathroom with a shower and toilet. Now, we would say that is quite impressive! Looking at the area, though, it does not seem too small or constricted at all. It looks, in fact, like the perfect space for comfortable and cosy living—ideal for a vacation. At the back we can see a wooden staircase going up to the small loft space of the house. This clever fixture makes use of alternating steps to decrease the width, and so save space. In addition, the stairs also house shelves, making this a double-whammy for clever space-saving ideas! In the interior of the home, the structures are made of metal, while the floors reproduce the outer coating of larch planks. In this case, however, the larch is bleached, creating is contrasting and modern effect inside the home. The designers obtained simplicity and linearity in the living space by the abundant use of continuous surfaces. 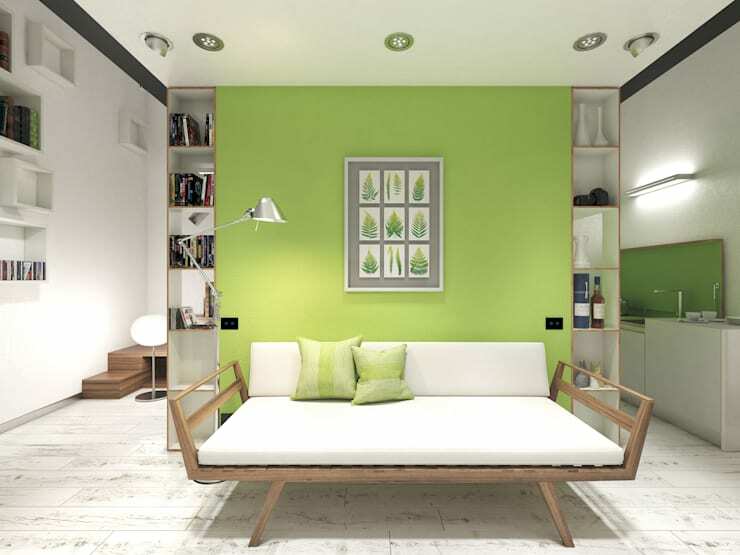 A plastered volume sits in the middle of the living area and is painted a bright, fresh green. This houses the bathroom, but also serves to separate the different areas of the open-plan living space. In front of the volume we find the living room, to the right is the kitchenette and dining table, and to our left you pass the compact library to the staircase leading up to the loft. Our small house also includes a loft, which hosts the bedroom. 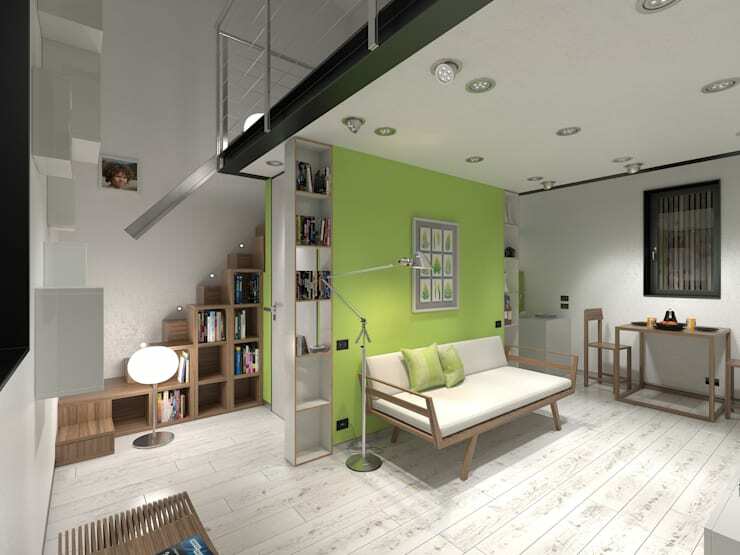 The loft itself is a mere 10 square meters, but includes a large double bed, as well as a small wardrobe. What else could you need for a vacation home? We can also see that a section of the front facade, just below the gabled roof, had been replaced by glass. 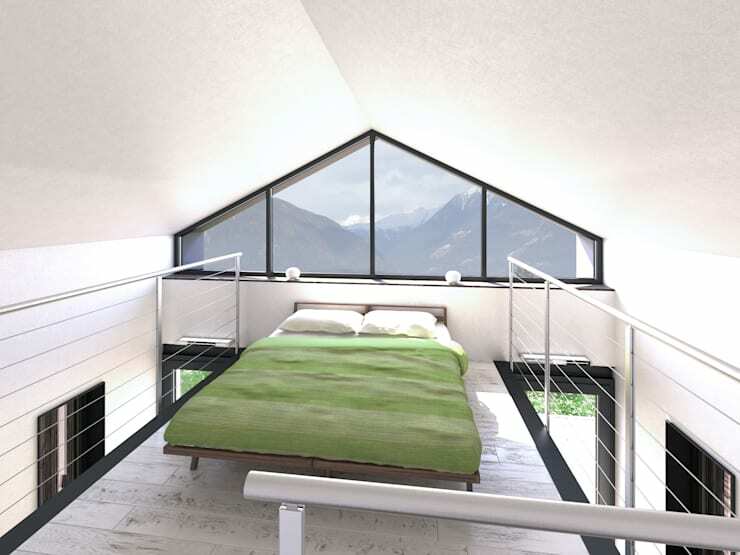 This allows ample natural light to enter the small bedroom loft, enlarging the space and making it feel lighter. It also offers the inhabitants extended views of the natural landscape, and all this from the comfort of their bed. The bedroom is certainly a retreat within a retreat, being the ultimate point of refuge in this small-home haven. If this simple and small home inspired you, why not take a look at what's involved in building your own small home? 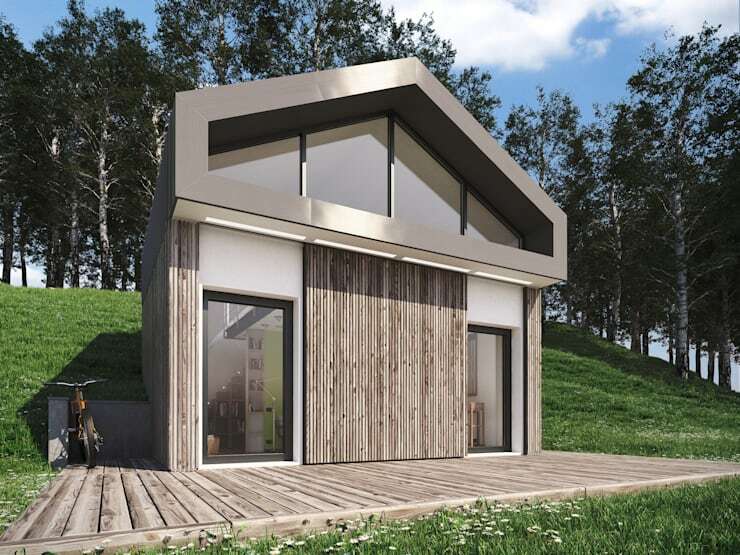 We'd love to hear your opinion about the Microhouse! Drop a line in the comments box.